Many people compare Vietnamese food with that of Thailand. It’s natural, because the two countries are neighbors, and countless ideas have flowed back and forth, intermingling as people cooked and shared. Given that, you’d think that Viet and Thai curries would have lots in common. They do, with regards to the use of coconut milk and aromatics. But interestingly, Viet cooks prefer curry that features Indian-style spice blends, like the madras curry powder used in this recipe. India has also influenced Viet culture for millennia, particularly through the Cham Kingdom long ago. For this chicken curry, called cà ri gà in Vietnamese, the curry powder is combined with lots of lemongrass and ginger to create a heady paste. Black pepper and cayenne inject pungent heat. By adding extra spices and aromatics, you can more easily finesse things to your liking. 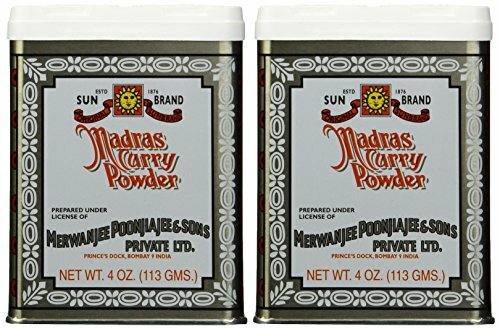 WHAT IS MADRAS CURRY POWDER? If you travel to Saigon (a.k.a. Ho Chi Minh City) and wander the popular Ben Thanh market, you’ll see several spice vendors who offer individual spices as well as signature spice blends. Each cook has her or his preferences, and as a Vietnamese-American who’s lived in the States for over 40 years, I adore Sun Brand’s Madras-style curry powder. It’s well balanced, with lots of citrusy coriander and zippy turmeric, along with warm spice notes in the background. My mom used to hunt it down at Asian markets, buying several metal cans at a time to avoid running out. Nowadays, it’s stocked in the spice section of many supermarkets and is sold online, too! It’s my go-to, and thank goodness, it’s easy to find. Despite its name, Madras curry powder is not a true Indian ingredient. The spice blend was inspired by Madras, a city in south India that’s now called Chennai. However, like with all “curry powders,” the spice blend was invented and popularized by the British. India does produce curry powder, much of which is exported. Yes, commercialism and colonialism have complicated many things, but they’ve also helped to spread ideas around the globe. Back to the spice blend itself. Madras curry powder can be mild, moderate, or hot, depending on the brand. Sun is a moderately spicy blend that allows me to control the heat source and heat level. Finish with coconut milk: Finishing the curry with thick, rich coconut cream refreshes flavors. It’s easy to obtain: let a can of coconut milk sit for a few days (or refrigerate for a few hours), then open and scoop out the fattier cream. The remainder is the thinner, lighter milk. Watch your sweet potatoes: White sweet potatoes are preferred for this recipe over orange-fleshed ones, but either can be used. (At the store, if you’re not sure about sweet potato type, break off a bit of the end to check flesh color.) Compared to white-fleshed ones, orange-fleshed sweet potatoes easily become mushy as the curry cooks, so if you use them, monitor the pot closely. For a more savory curry, you can also substitute regular potatoes—choose a potato suitable for boiling or roasting, such as red, white, or Yukon gold. Rustic yet elegant, this fragrant curry may be served with baguette for dipping or with rice; add a mild vegetable side, such as sautéed chard, to let the curry shine. If the curry is too hot, squirt on some lime juice to cut the heat. However you serve this curry, it is a seamless blending of cultures that reflects the unique amalgam that is Vietnam. I hope you enjoy it as much as I do. WANT MORE GREAT VIETNAMESE RECIPES? To divide each chicken thigh into three equal pieces, cut the flat side as one piece, then halve the thicker portion. If large thighs are unavailable, use smaller ones and cut each into two pieces. 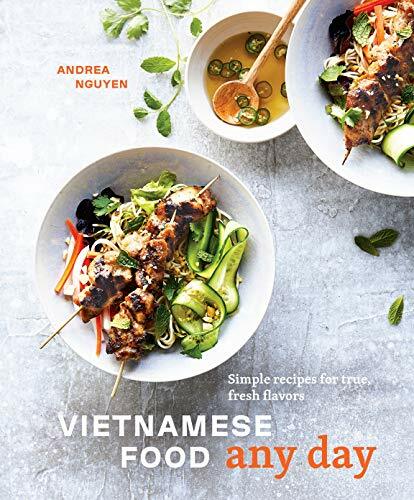 Reprinted with permission from Vietnamese Food Any Day: Simple Recipes for True, Fresh Flavors by Andrea Nguyen, Copyright ©2019. Published by Ten Speed Press, an imprint of Penguin Random House LLC. 1 Make the curry paste: In a food processor, whirl the lemongrass into a fine texture, about 3 minutes, pausing occasionally to scrape down the bowl. Add the ginger and pulse to finely chop. Add the onion and pulse again to chop. Add the curry powder, black pepper, and cayenne (if using) and whirl until you have a fragrant yellow paste, about 30 seconds. 2 Prep the coconut milk: Do not shake the can of coconut milk. Open the can and remove 1/3 cup of the thick cream at the top of the coconut milk. Stir the remaining lighter milk, and set both aside. 3 Begin cooking the curry: In a 3- to 4-quart pot over medium-high heat, melt the coconut oil. Add the lemongrass paste and cook for 3 to 5 minutes, stirring frequently, until fragrant and no longer raw and harsh smelling. Lower the heat as needed to avoid scorching. Add the chicken and 1/2 teaspoon salt, stir to combine, and cook for 1 minute to meld the flavors. Add the coconut milk and a little water to cover the chicken. Bring to a simmer over medium-high heat, cover, and adjust the heat to gently simmer for 15 minutes, stirring occasionally. 4 Add the sweet potatoes: Uncover the pot, add the sweet potatoes, and return the curry to a simmer. Continue cooking for 10 to 12 minutes, uncovered and stirring occasionally, until the potatoes are tender. 5 Finish the curry: Turn off the heat, stir the coconut cream into the sauce, and let rest on the burner’s receding heat for 10 minutes, uncovered, to blend and mature flavors. Taste and season with salt (unsalted curry powder may require an additional teaspoon), and splash in a bit of water if the flavors are too strong. Serve immediately, garnished with the cilantro. Hello! All photos and content are copyright protected. Please do not use our photos without prior written permission. If you wish to republish this recipe, please rewrite the recipe in your own unique words and link back to Chicken Curry with Sweet Potato and Lemongrass on Simply Recipes. Thank you! A bank examiner gone astray, Andrea Nguyen is living out her dream of teaching others how to cook well. She authored The Pho Cookbook, a 2018 James Beard Award winner and Wall Street Journal best seller. Her sixth cookbook, Vietnamese Food Any Day, released in February 2019. Andrea has contributed to publications such as the Washington Post, Wall Street Journal, Lucky Peach, Food & Wine, and Cooking Light. Delicious and everyone devoured it! I made it exactly as she wrote except…I used fish sauce instead of salt for more umami and I squeezed a splash of lime juice over it before serving. I probably added more cayenne than recipe said because we like the heat. Would make again for sure. Quite easy to do. I am now going on amazon to buy her new cookbook! I love curry and this one I should rich and full of flavor. The heat was perfect. Followed the directions to a tee. Turned out amazing and will be making this one again. It took a bit longer to cook the potatoes than stated but well worth it. This was really delicious and I think much better than the typical curries made with regular potatoes. I did find a white fleshed sweet potato at a Hispanic market near me and I also used an orange fleshed one. I added some peas near the end to make it a one bowl meal. The only correction I would make is on the cooking time after adding the potatoes. It took about 30 minutes for mine to cook through. Are you SERIOUSLY suggesting we damage the produce in the supermarket to find out if it’s “the right one?” You must be very popular in the store! I thought the same thing. Just ask the produce man about the items you are unsure of instead of damaging them. In Seattle, several groups of immigrants, Viets amongst them, would poke holes in bags of flour and starch looking for the correct one. It got to be such a problem for awhile (they can’t sell the ones damaged that way) that they had to put a camera in the aisle at the wholesale foods place I shopped for my business along with signs in several languages. Cultural thing?